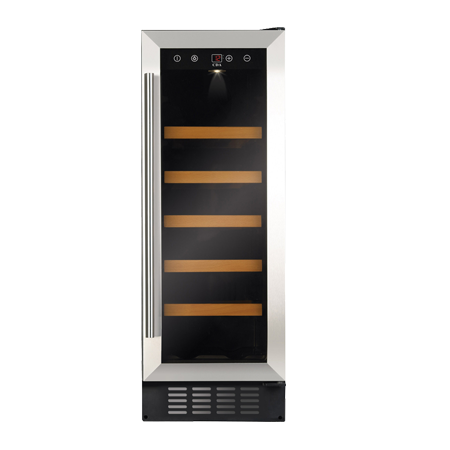 Store your wine collection at the optimum temperature in the CDA FWC303SS Wine Cooler.. This smart wine cooler has a 20-bottle capacity with five wooden shelves to help you safely store and display wine. The double glazed glass is smoked and UV protected to prevent unwanted exposure and potential damage. A digital display allows you to monitor and control the cooling environment while LED lighting lets you keep an eye on bottles or make a drinking choice without having to search. Electronic temperature control makes it easy for you to maintain the right conditions for wine storage. A compressor reduces the vibrations and noise levels, protecting wine and making sure the appliance remains unobtrusive in your kitchen. A handy temperature memory function remembers temperatures you have set so you dont have to re-program if you switch the cooler off. If the temperature does change in an unplanned manner, an alarm will sound so you can correct it quickly. A humidifier prevents wine corks from drying out and a height adjustable plinth section adds further convenience to bottle storage. Store, collect and enjoy your wine with the CDA FWC303SS Wine Cooler, a must-have for any wine fan.